The Irish Historical Research Prize is offered in alternate years for the best new work of Irish Historical Research, which must have been published for the first time by a graduate of the National University of Ireland. The work, which should be substantial, must be of an original character indicating direct research in historical records. Works previously entered for the Prize are not eligible for consideration. Works eligible to be considered for the 2019 Prize must have been published in the period April 2016 to March 2019. The closing date for applications is Friday, 3 May 2019. Governing Ireland: British Politicians and Ireland 1800-1921, published in 2016 by Oxford University Press. Literacy and Identity in Medieval Ireland, published in 2013 by Boydell & Brewer. The Friars in Ireland, 1224-1540 published in 2012 by Four Courts Press. The Annals of the Four Masters: Irish History, Kingship and Society in the Early Seventeenth Century, published in 2010 by Four Courts Press. Ireland, Philadelphia and the Re-Invention of America 1760-1800, published in 2008 by Four Courts Press. Map-making, Landscapes and Memory: A Geography of Colonial and Early Modern Ireland, c. 1530-1750, published in 2006 by Cork University Press. 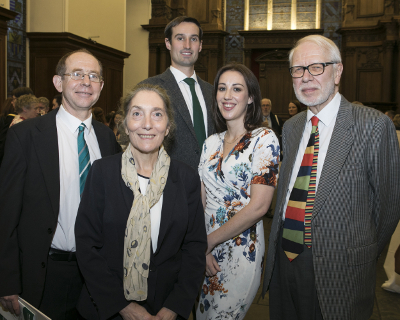 (L-R) Professor Tadhg O Hannrachain, Dr Carla King, Dr Conor Mulvagh, Dr Niamh Wycherley and Professor Karl Theodore Hoppen. The NUI Publication Prize in Irish History, first introduced as an NUI Centennial Award in 2008, is offered for competition in alternate years to graduates of the National University of Ireland of doctoral status. Works eligible to be considered for the Prize must be published as a first sole author book, following the conferral of a doctoral degree, in the period April 2016 to March 2019. The work, which should be substantial, must be of an original character indicating direct research in historical records. The Cult of Relics in Medieval Ireland, published in 2015 by Brepols Publishers. A most diabolical deed' Infanticide and Irish Society, 1850 - 1900, published in 2013 by Manchester University Press. The Transplantation to Connacht, 1649-1680, published in 2011 by the Royal Historical Society, Boydell Press. The Last Irish Plague: The Great Flu Epidemic in Ireland, published in 2011 by Irish Academic Press. The IRB: The Irish Republican Brotherhood from the Land League to Sinn Féin, published in 2005 by Four Courts Press. The Publications Committee meets in June and December to consider applications made under the scheme. by 1 June for consideration at the June meeting, and by 1 December for the December meeting. The University has traditionally provided a number of grants-in-aid annually towards scholarly publications by staff of the NUI Constituent Universities, on the basis of individual applications to the Senate. The scheme is open to full-time and part-time staff of the NUI Constituent Universities and Recognised Colleges. Under the scheme, grants of up to €3,000 may be awarded, following the Senate’s consideration and approval of recommendations submitted by the NUI Publications Committee, which considers applications at its meetings in June and December.